Get ready for three inspiring days! 7:30 – 8:30 AM: Registration and coffee. Breakfast on your own. 6:45 – 7:30 PM: Keynote and the winner of the Manuscript Contest will be announced. 7:30 – 9:30 PM: Art Show and Dessert, the winner of Art Show will be announced. Coffee at conference. Breakfast on your own. Meals provided at the conference (and included in conference registration) are: Friday evening dinner, and Saturday and Sunday boxed lunches. Dessert will be provided during the Saturday evening art show and coffee service in the morning will also be available. If you have a disability and require a support person in order to be able to take advantage of this event, please register yourself AND email the Registrar to ask for assistance in registering your support person. Space limitations require us to register support personnel; however, there is no fee or additional charge. Come one, come all! 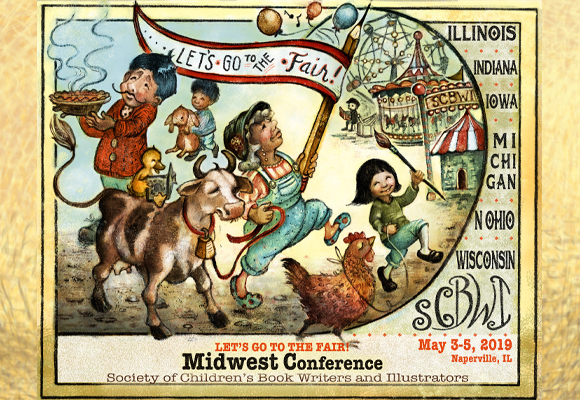 Step right up and witness the greatest show on earth—The SCBWI Spectacular Midwest Fair! Be amazed by fair-themed food, thrilling games, and dazzling performers. You’re also invited to be on the bill for this event, dressing the part of a performer, animal, or a fair-goer. Creative interpretations welcome, too. Blue ribbons will be awarded to the best costume. On Sunday morning, join member and yoga instructor, Susan Zonca, on mat or in chair to relax the mind, stretch and de-stress, focus intentions and be present in community. Comfortable clothing suggested. If you do not have a mat, you may use a towel or a chair. Special conference rates are available at the Chicago Marriott Naperville, (the conference hotel) through 4 p.m. on Friday, April 12, 2019. Rate: $120.00 per night (plus state/local taxes). To make overnight reservations, call 1-800-228-9290 and ask for the “Society of Children’s Book Writers and Illustrators” rate or reserve online using this link: Book your group rate for Society of Children’s Book Writers & Illustrators Conference 2019 . Reservations must be received on or before 4 p.m. 4/12/19 for the conference rate. STATEMENT OF INCLUSIVITY The Society of Children’s Book Writers and Illustrators is passionate about creating an inclusive environment that celebrates writers and illustrators from underrepresented communities, including (but not limited to) people of color, LGBTQIA+ people, religious and cultural minorities, disabled people, Native/First Nations people, and immigrants. By creating an environment where all writers and illustrators feel a sense of belonging, we can create books that honor all children. PHOTO POLICY Attendance at this event constitutes permission for your photograph or video to be taken at the event and used for SCBWI purposes. However, if you have an objection to your photo being used, please email a .jpeg of your image to Kirbi Fagan at michigan-ic2@scbwi.org by April 15. If you opt out, please be aware that attendees may be photographing and posting on social media at this event, so it is the responsibility of the individual to monitor their inclusion in photos. BLOGGING/RECORDING Audiotaping, videotaping, and/or transmitting any part of this conference is prohibited. The presentations and handouts are copyrighted and may not be reprinted, blogged, tweeted, or reproduced in any way without written permission of the copyright holder. You may share your thoughts about the conference and some brief quotes, but please respect our speakers and the copyright law by not giving away detailed notes. Thank you for your professionalism. WEAPONS POLICY It is the policy of the Society of Children’s Book Writers and Illustrators to maintain an environment that is safe for all persons. To achieve this objective, it is the SCBWI’s policy to maintain a firearms and weapons free environment at all of our events and prohibit the possession of firearms and weapons regardless of any license or permit that an individual may have which would otherwise authorize the individual to carry firearms or weapons. Weapons are defined as anything that is intended to cause harm to another person. No refunds will be granted for manuscript critiques, portfolio reviews, manuscript contest fees. The registrant must contact Leslie Helakoski at michigan-RA@scbwi.orgto request a refund. If granted, a $50 processing fee will be deducted from the total. No refunds for manuscript critiques, portfolio reviews, or manuscript contest fees. The registrant must contact Leslie Helakoski at michigan-RA@scbwi.organd request refund.